The thing with reading dystopian science fiction is that I always have a niggling suspicion that the ‘depressing future’ the writer is writing about is really the present, from a different point of view. Shiv Ramdas’ Domechild brings home this feeling rather quickly. A society of people who cannot think beyond their immediate reality. Who spend hours in a cubicle, chatting on a social network with people they will never meet. Who do not talk to each other at all, but interact continuously with machines. The differences are there, of course. In Mr. Ramdas’ vision of the future, these acts have been enforced, rather than evolved. Talking to your neighbour invites incarceration. Forming an emotional connect is forbidden. That, then, is his vision of dystopia – an extension of present reality. Domechild is the story of Albert a regular schmuck living in the ‘Dome’ city, going to work at a pre-defined time every day, doing his eight hours of meaningless chatter on a social network, and worrying about the things the government tells him to worry about – outsiders (those who do not live within the Government’s control) and addicts (slaves to information overload). Until the day Albert misses the last bus home and finds himself forced to walk through a dumping ground, where he encounters Theo, a pre-teen girl who first jolts his acceptance of life under the Dome. From here, Albert goes through a harrowing adventure, encountering a host of characters, from the creepy assassin Marcus, the upright Colby, the suicidal robot SUE to the unfathomable Father and the messianic Vail. There are elements of Asimov to the setting, the Dome reminiscent of the ‘Caves of Steel’, but this is Asimov with a macabre twist, where life is cheap and rigid adherence to the law makes the humans more machine-like than the machines. 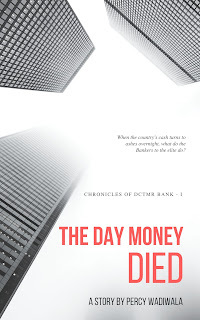 The first half of the book deals with Albert’s escape from the Dome, goaded by SUE and Theo, while the second half brings us to Sanctuary, the lair of those who do not submit to the government-that-is. Other factions such as the Renegades and Seekers make an appearance, and it is clear that Mr. Ramdas is setting up a pretty intricate story. The descriptions are done well, with an eye for detail. At times there seemed to be almost too much time spent on moving characters from one place to another, though that is probably a matter of the reader’s taste. Similarly, while the author is clearly very skilled at dialogue-writing, when there are less than a hundred pages left, and two characters are engaging in banter, however hilarious, one does want to say “Get on with it!” I suppose characters aren’t aware the book is near the end, so that’s one way of looking at it. Broadly, Domechild is an adventure novel. Things are always happening, and the 392-page length does not seem onerous at all. There are elements of social commentary as well, but they are not heavy-handed. Events unfold slowly in the beginning and then very rapidly as the pages fly by, but there is almost too much in the final fifth of the book, with exposition, fighting and humour all seeming to bunch up too much into each other. The only other issue with the book is the slightly abrupt ending. True, this appears to be just the first part of a series, but the fates of both Albert and Theo are left hanging in the air, as it were, and that is less than ideal. 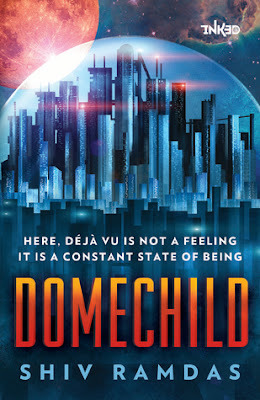 All in all, Domechild is a very well-written and quite original piece of work. Stylistically sound and with language far more polished than I have come to expect from contemporary writers, there is not a moment when it overtly disappoints. Mr. Ramdas stitches together disparate elements smoothly. His handling of positions and people in ‘action’ scenes is worth emulation. Enthusiasts of science fiction and fantasy will find much to like. Writers of any genre will find much to adapt. Plotting, action and dialogue are impeccable. My major cavil, perhaps, is that the author has not developed themes he could have – Albert’s impressions on the difference between life in the Dome and in Sanctuary. The cultural jolt he would have experienced. Some more details about Domechildren who have gone before Albert. I do hope they will be dealt with in future instalments. The author and I have frequently disagreed about Cricketing matters on social media. Like Domechildren on the Network, we have sparred over the merits of rich men who are paid to swing a wooden bat or throw a leather ball. I have tried not to let this colour my review of a book I have paid full retail price for. Hi! Do you happen to know if he's still working on a sequel? I read this years ago and he said he was but I haven't heard anything since. I am informed by reliable sources (i.e. the horse's mouth) that it is being written. Second-draft tinkering, as it were.